Registrations are accepted on a first-come, first-served basis. All participants must agree to the terms and conditions before registration will be processed. A complete registration form is required for each participant. By agreeing to the terms and registering for an event, participants release 4 Crafty Hearts, any employees, vendors, sponsors, or instructors from any and all liability, damages, claims, losses, lawsuits, costs, and expenses of any kind associated with an event. To confirm registration and reserve your space at an event, a $50 deposit is required. Payment in full is required at least 45 days prior to an event. Final payments not received 45 days prior to an event are subject to cancellation and forfeit of deposit paid. Registrations received within 45 days of an event must be paid in full at time of registration, although overnight accommodations cannot be guaranteed. Returned checks will incur a $25 fee. Event rates do not include any incidentals incurred by you such as phone bills, roll-away beds, refrigerators, room service, movie charges, etc., and it will be your responsibility to pay the hotel for these extra charges before check-out. Refunds will not be given within 45 days prior to an event due to contractual obligations with the hotel and vendors. A $10 processing fee will be deducted for all refunds. Refunds will not be given to participants who do not attend and have not expressed written cancellation at least 45 days prior to an event. All cancellation requests must be made in writing to 4craftyhearts@gmail.com. Please be sure to include your name, address, phone number, and e-mail address. You will be contacted within seven business days to arrange refunds if within the cancellation period. Impact of Cancellation on Roommates: When you cancel, the cost of attendance for your roommate(s) will be automatically adjusted and they will be responsible for the increased cost. They have the option to cancel their registration or replace your registration spot. No refunds will be given until full payment is received from all participants. Refunds will not be given for weather-related travel delays, etc. No refunds will be given in the event of a weather related cancellation. 4 Crafty Hearts will make every effort to reschedule the event and will transfer your registration accordingly. Registrations may be transferred from one individual to another up to ten days prior to an event with a $10 processing fee. 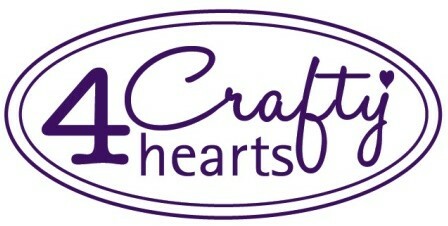 All transfer requests must be made in writing to 4CraftyHearts@gmail.com. 4 Crafty Hearts reserves the right to cancel an event and is not responsible for travel expenses or other costs incurred by registrants. If there are not enough participants for an event, the event may be cancelled and all participants will receive a full refund. Only registered attendees will be allowed in the crafting room(s). No children under the age of 10 may be present without permission of 4 Crafty Hearts. All personal supplies must be placed within the designated space allowed. Blocking of aisles or moving tables is strictly prohibited. No open drinks will be allowed. A spill proof container must be used at all times. The sale of products by individual participants during an event is strictly prohibited. 4 Crafty Hearts does not supply electrical cords or access to outlets for personal table lights. Attendees are welcome to bring battery operated lighting or their own extension cords/power strip. By registering for a 4 Crafty Hearts event, you give your consent to be photographed during the event, as well as your scrapbooks and paper crafts. Such photos may be used in future publicity and/or promotional campaigns. The Creation Station is equipped with paper crafting tools and is available to all attendees for unlimited usage during an event. By registering for an event, you agree to use reasonable care and caution when using the equipment, some of which is capable of causing personal injury if used improperly or carelessly. You agree to hold 4 Crafty Hearts, its principals, employees and agents, harmless from any and all liability resulting from equipment usage. Read and review all event terms and conditions prior to registering. Your registration serves as confirmation that you have read and understood the terms and conditions.